- Metallic - Natural Metallic Luster provides brilliant design and style to resinous flooring system. - Viscos-Elastic - Polyurethane System with EPDM granules. Soft, Resilient - Comfortable, Monolithic. - Skid Resistant Parking Lot flooring hard wearing. - Decorative - Enhance your High Performance flooring environment by adding Custom Color, Texture am Themes. 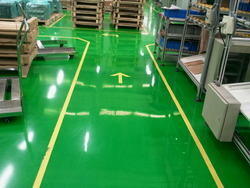 Our firm is a foremost name, involved in providing a diverse range of Epoxy Coating Flooring. Experts use the advanced techniques to develop this product as per client’s demand. The EPOXY Flooring is a mixture of various components, laid on concrete floor. Owing to jointless finish and less undulations, this flooring provides the clean places by preventing the dusts and dirts. 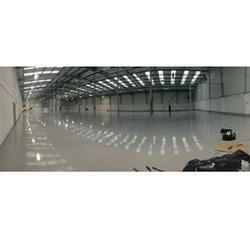 We provide the EPOXY Flooring services to our clients. smooth flooring, grees, oil free & looking nice.